Alexandra Schultheis Moore and Elizabeth Swanson Goldberg discuss their edited volume Teaching Human Rights in Literary and Cultural Studies with James C. Hatch. JCH: You have both published widely on human rights and related topics. How did your new book, Teaching Human Rights in Literary and Cultural Studies, begin? ASM: After the 2005 conference The Humanities in Human Rights: Critique, Language, Politics, where we first met, we decided to organize a multiday panel on theoretical and pedagogical approaches to human rights and literary production at the 2008 American Comparative Literature Association annual convention. This tremendously rich panel allowed us to begin to think more systematically about the methodologies we use in our research and classrooms to approach literature through the lens of human rights. Those initial conversations provided the seeds for our two coedited collections, Theoretical Perspectives on Human Rights and Literature (Routledge, 2011) and Teaching Human Rights in Literary and Cultural Studies (MLA, 2015). ESG: It occurred to us at the 2005 MLA conference that questions about the relation between the humanities (specifically literature) and human rights were being prompted at that particular moment by political developments, most pointedly the use of torture by the US government in its “war on terror.” The meeting had an atmosphere of urgency for this reason, and yet we came away feeling that the day’s attempts to historicize the relationship between the humanities and human rights were done mostly in the service of securing some kind of purchase for the humanities in the urgent human rights contexts of the day, while the question of what human rights could bring to the humanities was less palpable. Having worked at that nexus for some time under what often felt like lonely circumstances, we gravitated to each other. Our first conversation was about the desperate need to theorize the interdisciplinary junctures of work in literature and human rights, as well as to consider the many challenges of teaching at this juncture. What do we talk about when we talk about literature and human rights? The publication of Teaching Human Rights in Literary and Cultural Studies represents the second part of our “state of the field” investigations, after our 2011 collection, Theoretical Perspectives on Human Rights and Literature. JCH: What is the biggest challenge in teaching human rights and literature? ASM: I imagine different teachers will have different responses to this question. For me, there are two main challenges. First, I think it can be a challenge to manage student expectations for the class. Students often enroll in a human rights and literature class with the idea that the class will raise their awareness of human rights violations and that literature in and of itself is somehow ennobling—that reading about suffering will make us better people. Therefore, I try to make it very clear at the beginning of my classes that while we want to be open to the emotional call of the texts we read, our primary task is to analyze why and how certain kinds of stories are told in literary, legal, and political discourses. The second challenge stems from the first: that we will necessarily be reading interdisciplinarily in order to see how conventional human rights discourses (laws, human rights reports, reportage), on the one hand, and literature and visual culture, on the other hand, influence and respond to one another to make visible some kinds of stories, perhaps at the expense of others. Such interdisciplinarity is pedagogically strenuous, requiring instructors to delve into historical, cultural, and political contexts that may be unfamiliar while also attending to the exigencies of teaching the literature itself. Such demands will be different according to the level of study (undergraduate versus graduate) and institutional context, but in our experience the quotidian struggle between text and context takes on grand proportions in the literature and human rights classroom. JCH: Reading about human rights violations necessarily involves reading about atrocity. How do you teach material that carries so much emotional weight? ASM: This is tricky both because of the specific dynamics of any given class and because of the need to create a classroom space where both emotional response and analytical thinking can take place. There are formal ways of doing this, such as Ann Berthoff’s method in The Making of Meaning of using double-entry notebooks. Students pull out key passages of the text at hand and then have a column for writing their emotional responses to those passages. Students can then circle back to those passages and create a second column where they begin to think about why the passage has the effect it does and how it seems to be functioning within the text as a whole. This kind of exercise can help students to begin to process the material on multiple levels before class discussion and in preparation for more complex writing assignments. I think it’s also possible to do this kind of work during class discussion so long as the atmosphere of the class is open to all perspectives and students feel comfortable moving back and forth between emotional responses and analyses and trying to figure out how they are related. ESG: I often make room for affective responses to the literature in a discussion board or wiki on our shared classroom Web site (in this case, Blackboard). This is a space where students can articulate and gain feedback on their emotional responses—how the text “hits them,” so to speak. We may briefly address those responses at the start of our discussion of a text and refer to them throughout as fuel for our analysis not only of the text (plots, characters, themes) but also of the relation between reader, text, author, and context, and for how our reading situates us in relation to those who have suffered the atrocities detailed in the literary or cultural texts. I make use of “trigger warnings” at the start of the semester in a general sense and then in a much more focused way throughout the course: for instance, regarding the graphic sexual violence in James Levine’s novel of brothel slavery in India, The Blue Notebook, or regarding racial violence and its long history in Claudia Rankine’s poetry collection Citizen. We also discuss emotional responses from a metaperspective, asking how authors represent atrocity, pain, and suffering, and to what effect (and affect) on reading publics situated in different geopolitical relations to the texts. JCH: How does the study of human rights enhance the study of literature? ASM: Human rights offers a framework for examining how certain kinds of stories and subject persons become recognizable or legible in legal, political, and cultural terms. The objective, for me, is not to promote human rights or to condemn them as a tool of Western imperialism or military intervention. Instead, I find that using human rights as a lens allows us to analyze how stories about legal standing, egregious suffering, and the atrocities states commit are formulated and how they circulate. Also, a human rights–oriented approach to literature illuminates the stakes of responsible reading. What I also love about this field is the way it invites consideration of many different literary and aesthetic forms for how they respond to and represent human rights. When we compare different literary forms and genres for how they imagine a particular human rights context, the techniques of those forms and genres—how they compare to one another, what they do best, to whom they are addressed—are made visible for analysis in striking ways. JCH: Concepts like empathy, sympathy, and identification, as well as justice and equality, must arise in classroom discussions about human rights and literature. Is there an assumed literary theory or theory of reading at work in such discussions? How do you make students aware of these? ASM: I wouldn’t want to say that there is any single theory or approach to these questions. The dynamism of the field is that it raises the question of what these concepts might mean for different stakeholders and who can define them in which contexts. I do think Joey Slaughter’s warning against fostering a kind of “literary humanitarianism,” in which readers feel as though they have accomplished human rights work by reading sympathetically, is consistently important, and I return to his critique again and again. This critique asks us to attend more closely to the structural relationships between cultural production and legal and political standing, so it opens up avenues of exploration instead of foreclosing them. I am also interested in teaching students to think critically about how a given text seems to interpellate the reader and to ask for a response. Is a text asking us to feel, to imagine, to understand? How is it inviting the reader into the story? Tsitsi Dangarembga’s short story “The Letter” brings these different ways of reading to the surface, and I often teach it in the beginning of the semester to raise these issues early and to have a touchstone for talking about them. Other texts that work particularly well for me in helping students recognize these different ways of responding in relation to close reading are a sequence of Carolyn Forché’s poems. I often teach “The Colonel,” “The Memory of Elena,” and then “The Garden Shukkei-en” and “The Testimony of Light” (which are two sections of The Angel of History) because through them we can see how Forché is wrestling with how poetic language can represent atrocity. JCH: Is there such a thing as a literature of human rights? ASM: For me, the answer is no. I’m less invested in trying to define a category of human rights literature than in thinking about how an approach that foregrounds normative human rights and their alternatives can help us to analyze literary and cultural production in new ways. I also find that students produce very sophisticated work about how different kinds of cultural texts can work with or against human rights, in both their positive and negative functions—how literary and aesthetic attributes can, for example, conjure victims; help us to imagine the desires and rights of violated persons in ways that might not correspond to categories of legal standing; and help us to imagine other futures than those promoted by either perpetrators or human rights instruments, to name but a few options. That said, James Dawes argues in a forthcoming article in American Literature that there is a human rights literature subgenre of the contemporary US novel. We’ll need to talk about this question again after Jim’s article comes out in March! ESG: I agree that it is very difficult to identify a literature of human rights without falling into the potential traps of gauging the level of suffering or gauging the nature of subject matter that would “rise to the level” of a generic classification. As several of the contributors to this volume have shown, the tools of human rights–oriented literary criticism can be used as a responsible reading practice for virtually any text, examining the manifestation of human dignity, the building (or destruction) of cultures of human rights, and the exigencies of legal, cultural, political, and historic contexts in . . . plots and settings that take up questions of relations between individuals or groups and states and nonstate actors. JCH: What are some of the key debates in the field of literature and human rights, and how do you invite students into these debates? ESG: One genealogy of the field of human rights and literature would situate the field’s source in theoretical work on trauma and representability that emerged in the 1990s via psychoanalysis and Nazi holocaust studies alongside scholarship in law and literature; these studies laid ground for examinations of the politics of genre and the ethics of representing violations in a range of historical, political, and cultural contexts. If grave rights violations are essentially traumatic and, therefore, unspeakable, how then could literature represent them? And what are the ethical implications of such representation? How are certain genres and forms implicated in the creation or destruction of cultures of dignity and rights, and of the legal regime of rights that arose in the post–World War II moment? ASM: Another central debate is over the status of normative human rights as a framework for social justice. There are many ways of highlighting this debate and asking what it means for literary studies: for instance, looking at how the post–World War II “regime” of human rights depends upon the power of nation-states (whose formation undoubtedly entails violence) or considering the debates around humanitarian military interventions and the Responsibility to Protect (R2P). We can ask whether the texts we study seem to depend upon constructs of the nation-state or, to take the example of humanitarian interventionism, seem to call for an international response. JCH: How is the human rights–oriented approach of the book different from, say, trauma studies or other related fields? ASM: In the book, we try to emphasize this distinction: that a human rights–oriented approach foregrounds the normative structures of human rights so that we may understand how these structures function, whose interests they serve, what they exclude, and how those patterns—which are visible in a study of narrative and its contexts—relate to other forms of narration and to imaginative discourse. In those ways, our work is more focused on narrative structure and aesthetic techniques in relation to legal, political, and historical contexts than it is on psychic responses to atrocity and suffering. That said, these approaches can inform one another. Recent work in trauma studies, like that of Stef Craps, for instance, that emphasizes reading trauma in terms of its historical and cultural context rather than in abstract psychoanalytic terms can help us to read about human rights violations in more nuanced and sensitive ways. JCH: What does the book offer someone new to teaching this material? ASM: I hope the book offers someone new to the material a way to think through some of the material’s pedagogical challenges as well as specific classroom exercises and recommended texts. We also tried to ensure the book would be useful for teachers who approach human rights from different historical, geographic, literary, and linguistic standpoints. More specifically, the first section focuses on the conceptual apparatus of human rights and literature as an area of study: how human rights foregrounds the philosophical question of what it means to be human (Parikh and Matlin), how the question of who counts as human is linked to categories of legal personhood (Anker), and how human rights are critiqued as tools of the West, on the one hand, but may also be employed critically with other cultural approaches to justice and social and legal standing (Moore and Goldberg). The later sections of the book provide examples (and theorizations) of approaches grounded in various historical contexts, kinds of classes and pedagogies, and specific violations. Thus, teachers can start with what is most familiar or central to their class focus but might also find useful pedagogical approaches outlined in chapters that address different areas of study. The last section of the book is devoted to resources. JCH: What are the challenges and rewards of teaching literary and cultural texts through the lens of human rights in the world right now, given the post-9/11 context of ongoing terrorism, the mass migration of refugees, and the negative impacts of climate change? ESG: I have found over my twenty years of teaching this material that students are hungry for language and theoretical tools to help them understand the political events and contexts that are made ever more visible and present through the twenty-four-hour news cycle, the Internet, and social media. While some critics strenuously object to the nomination of human rights as a lingua franca for social justice more generally, one of the rewards of this teaching is its provision of a legal framework with deep historical contexts in which to situate complex, troubling, and often chaotic world events. Like many faculty members in the current moment, I struggle with the paradox that my students are on the cusp of their adult lives at a time when the future seems very uncertain; the literature and human rights classroom can provide a public intellectual space and discourse community for examining that uncertainty and for imagining other futures. JCH: What surprises students the most about the material you teach? ESG: As much as the instructors represented in our book attempt to work against the grain of simple “consciousness raising,” the kind that can set up what Joey Slaughter has called a sense of “noblesse oblige” in the (presumably “first world”) reader of texts about atrocities that seem always to occur in “faraway” places (the “literary humanitarianism” that Alexandra references above) and that cannot begin to account for the complex demographics and dynamics of our global and multicultural classrooms, we still find that students are tremendously surprised that many of the rights violations they encounter in the literature are, in fact, happening. This sense of awareness can, however, . . . be used to foreground the complexity of global human rights discourses and policies, the inclusions and exclusions that accompany even our most basic definitions: Who counts as human according to the international rights regime? What is the difference between being human and being a person recognized before the law? What counts as a right and who counts as a bearer of rights? How do the rhetorics of the human and of rights evolve over time in particular political contexts, and how are rights rhetorics mobilized in support of ideologies or policies that effectively abrogate the rights of some in order to preserve the rights of others? For instance, learning about the changing definitions and applications of torture by the US in its war on terror, or about other systemic rights violations committed by representatives of democratic states that were themselves authors of the United Nations Universal Declaration of Human Rights (1948), remains a revelation for many students. JCH: How do you think human rights and literature as an area of study will change in the future? How will it, as the title of one of your essays puts it, go “beyond the post-/colonial and the West”? ESG: Work in human rights and literature is advancing on many fronts; as always with this complex interdisciplinary field, one of the greatest challenges is to identify boundaries for the field. One logical direction involves revisiting and building upon 1980s postcolonial and Marxist literary criticism so that we may understand how issues of identification, inequality, and injustice continue to be present in colonialist or imperialist legacies as they are manifested in twenty-first-century global terrorism, migrancy, and ecological disaster. Ecocriticism and transnational feminisms have a great deal to contribute to the field, which may also arguably be moving from examinations of representation and representational ethics to studies of discourses from classical rhetorical perspectives. JCH: Thank you for generously taking the time to do this interview. Alexandra Schultheis Moore is associate professor of English at the University of North Carolina, Greensboro. She is the author of two monographs, Regenerative Fictions: Postcolonialism, Psychoanalysis, and the Nation as Family and Vulnerability and Security in Human Rights Literature and Visual Culture, and editor, with Elizabeth Swanson Goldberg and Greg Mullins, of a special issue of College Literature on human rights and cultural forms. She is also editor, with Sophia McClennen, of The Routledge Companion to Literature and Human Rights. Elizabeth Swanson Goldberg is professor of English at Babson College. The author of Beyond Terror: Gender, Narrative, Human Rights, she edited a special issue of Peace Review on the film and literature of human rights. Her many articles on human rights, gender studies, and literature can be found in edited volumes and in journals such as Callaloo, Humanity, and South Atlantic Review. 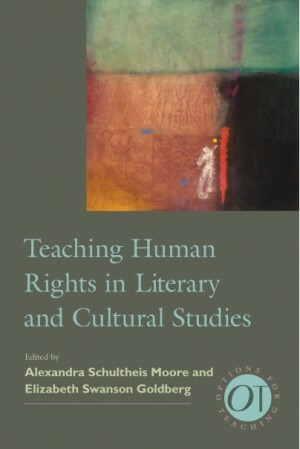 Moore and Goldberg have also coedited Theoretical Perspectives on Human Rights and Literature.